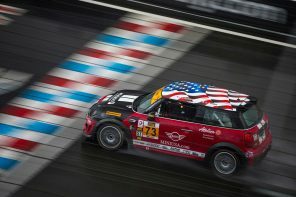 This is the first in a series of official releases by MINI USA that details the US spec 2008 line-up. 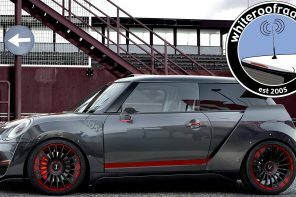 While there may not be any new info in these releases for the current MINI owner, they represent a good read for those seriously looking at buying a MINI for the 2008 model year. Further convertible information can be found in the MotoringFile R52 section. 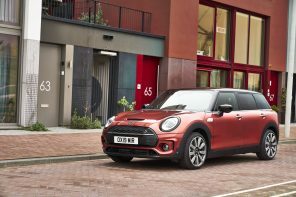 Official MINI USA Press Release: Convertible and MINI Cooper S Convertible bring the fun of open to motoring to the MINI brand. The authentic four-passenger convertibles have been engineered from the ground up to be fun-to-drive cars while offering a high level of safety and practicality. The design of the MINI Convertible does not compromise appearance, functionality and engineering, and remains honest to the MINI concept of go-kart-like performance with a recognizable “MINI” appearance from every angle. 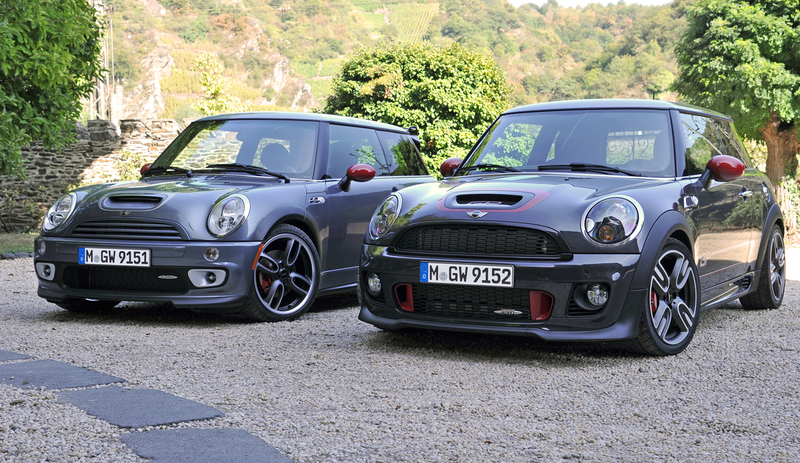 Popular option groups like the MINI Convertible Sidewalk package and John Cooper Works kit remain for 2008. 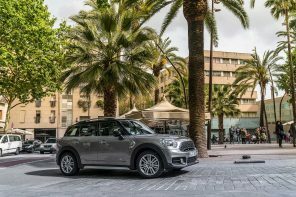 The Sidewalk package offers an exclusive look, featuring special light-alloy wheels, an attractive interior surface trim and leather upholstery developed specifically for the package. In addition, the package offers English leather sport seats in malt brown and Sidewalk interior surfaces and graphics. And the steering wheel comes wrapped in special Sidewalk sport leather. 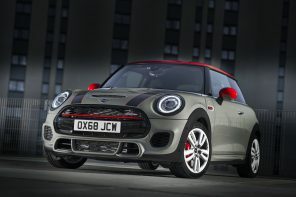 The John Cooper Works kit remains a factory installed option for the MINI Cooper S Convertible. 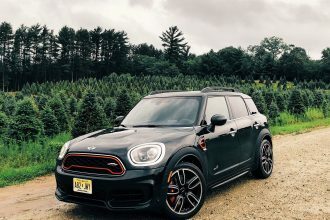 This performance-oriented option includes the engine-performance kit, limited-slip differential and the John Cooper Works brake kit. Following the concept Alec Issigonis used as his blueprint for the first generation Mini in 1959, the MINI Convertible utilizes its compact exterior dimensions while making optimum use of its surprisingly spacious four-passenger interior. And the stiff body/chassis package, combined with its sport tuned suspension, gives the MINI Convertible superior handling and agility. The MINI Convertible is packed with sophisticated technology reinforcing MINI’s premium positioning within its market segment, most notably the fully automatic roof with a truly unique integrated sliding sunroof function and the expandable easy loading system to maximize accessibility to the rear cargo area. Other technology includes multi-arm rear suspension, runflat tires with a tire monitoring system and an available navigation system. 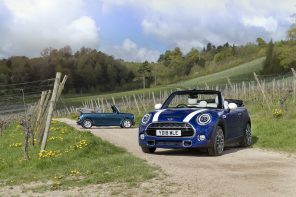 The MINI Convertible comes on the scene with a unique offering in the convertible market Ã¢â‚¬â€œ an automatic convertible roof with an integrated power sunroof. The sliding sunroof on the MINI Convertible is designed with a rigid panel under the first section of the canvas. When the top button is first pressed, the section slides back along the top rails to create a16-inch opening overhead. The sliding sunroof can be operated while the vehicle is in motion up to speeds of 75 miles per hour, offering open-air motoring while on the go. In its standard mode, the MINI Convertible’s roof goes from closed to open in just over 15 seconds. The roof operates at the touch of a button and does not require the manual release of any latches. Powered by an electro-hydraulic system, the top’s frame mechanism automatically unlatches and retracts. The four side windows lower automatically as the soft top folds neatly to the rear. The ingenious and compact “z”-shaped folding mechanism lets the roof fold compactly to store behind the rear seats. Also, there is no need for a tonneau cover when the top is folded because the front section of the roof provides protection when the soft top is down. The top operation can also be controlled by ingenious features built into the remote locking system. The key-operated remote locking system not only operates the doors, trunk and fuel door, but can open the roof and side windows from a distance of up to 50 feet. The first press of the unlock button on the key fob unlocks the driver door. When the button is pressed and released a second time, the passenger door, fuel filler flap and rear boot lid all unlock. If the button is pressed the second time and held, all four windows lower and the sunroof opens up. Lastly, if the key fob button is released, then pressed and held for the third time, the convertible top will fully retract Ã¢â‚¬â€œ all this can be done without opening a door. The top can also be fully closed from outside the car. By inserting the key into the driver’s door lock, turning and then holding it in the locked position, the top will raise and fully latch, all four windows will close simultaneously and the doors and rear boot will automatically lock. To top it off, the MINI Convertible top comes standard with a heated glass rear window helping to maintain a clear view even in inclement weather. The top comes in three colors, blue, black and green. Another unique feature of the MINI Convertible top is the easy load system. This feature allows the car to swallow up cargo through the rear boot in a very ingenious way: With the top up, the lower rear edge of the top can be unlatched from inside the cargo area. This allows the rear edge to swing up 35 degrees to increase the size of the rear opening (since the “normal” trunk lid opens by dropping down thanks to bottom-mounted hinges), easily allowing large items to pass into the cargo area. 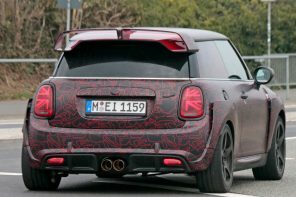 Due to the MINI Convertible’s very rigid body structure, there is no need for a cross member at the top of the rear boot opening, nor a need for a rear bulkhead behind the rear seats. This allows for 50/50 split rear folding seats that can easily accommodate large or awkward sized items. With the top in the up position, trunk capacity is 5.8 cubic feet, and even with the top down, the trunk provides 4.2 cubic feet of luggage space. With the rear seats folded down, cargo capacity is increased to a remarkable 21.3 cubic feet. Maximum load capacity is 771 pounds. While the top is down, the rear seatbacks are lockable in their upright position, so luggage in the trunk is protected from theft. A rear parcel shelf is provided for safety and security. With the top lowered, the rear parcel shelf acts as a shield for the rear glass window to protect it from possible damage by cargo in the trunk. The top has a safety feature whereby it will not lower unless the rear parcel shelf is properly installed. With the top in the up position, the parcel shelf visually secures the rear cargo area so valuables can be stowed out of sight. The cargo shelf can be easily taken out when maximum cargo space is needed. 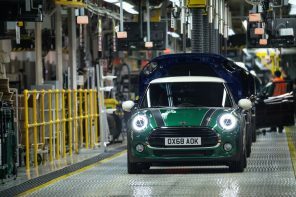 Taken from classic Mini design, the Convertible has externally mounted hinges on the rear trunk lid that is designed to swing down to open. These signature MINI hinges are further accentuated with the optional exterior chrome trim package. When open, the trunk lid is held in position by two supports, creating a practical loading platform capable of carrying up to 175 pounds Ã¢â‚¬â€œ making the open bootlid a perfect place to hold a cooler or snacks when tailgating. An added benefit of the boot lid opening downward is that it offers easier visibility and access to the rear cargo area without the need to bend down or duck under the open lid. The MINI Convertible also comes with a soft-touch electric latch release located in the trunk handle. The MINI Convertible design combines sporty muscular styling with the functionality of a true four-seater, and yet looks like a MINI, top up or down. 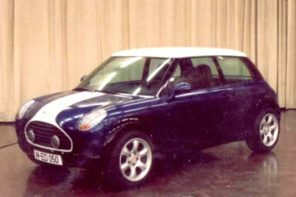 When closed, the roof of the MINI Convertible is slightly lower than the roof of the MINI hardtop; however the car still retains the signature MINI upright silhouette. Due to the rigid structure of the car’s body, the MINI Convertible does not require a protruding B-pillar or a “basket handle” structure behind the doors. Additionally, the windshield is at an upright angle, providing more open space overhead. These design elements lend a feeling of spaciousness when the top is open and underscore that the MINI Convertible is a true open-top car. 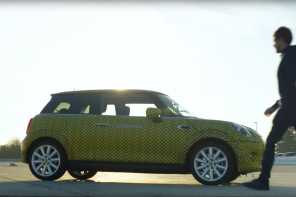 Like all MINI Coopers, the MINI Convertible’s most recognizable aspect is its face. The MINI Cooper Convertible sports distinctively designed front bumper, headlights and front grille. 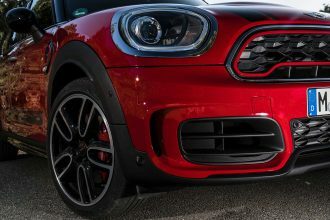 The smoothly sculpted front bumper comes with chrome accents, which, along with integrated fog lamps, add a look of elegance, all while retaining MINI’s signature bulldog look. The MINI Cooper S Convertible continues to be distinguished by the design cues which underscore the performance provided by both what’s in the engine compartment and the engineering of the chassis. The air intake scoop on the hood provides a muscular appearance as well as feeding fresh air to the supercharged engine’s intercooler. The intercooler sits below a slight bulge in the hood, which is 1.6-inches higher than the standard hood. 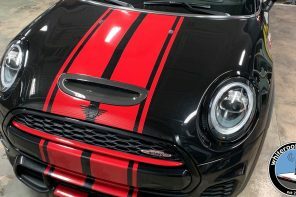 The MINI Cooper S Convertible also features body-color bumpers and three-slat grille, front and black, honeycomb lattice integrated into the lower valences. The design of the front headlights provide enhanced illumination while adding a striking design element to the Convertible. The light produced by the halogen lamps is deflected through a reflector system which helps increase light efficiency. The MINI Convertibles also feature “Pathway Lighting,” a standard safety and convenience feature. When activated, this feature allows the headlights to remain lit for 30 seconds after the driver has left the vehicle. Optional Xenon headlights with automatic leveling make the transition from bright light to darkness more gradual. The Convertible’s short rear overhang is integrated with the curves of the quarter panels and black rear-wheel arches, thus providing a sporting character for the car when viewed from a rear angle. The back-up lights are incorporated into the taillight design which feature clear covers. A black honeycomb trim insert between the two chrome strips on the rear bumper is reserved for the optional rear accessory fog lamp. With the top fully lowered and stowed snuggly behind the rear seats, the Convertible takes on the look of a muscular sports car. The standard high-strength aluminum roll bars are visible just above the rear seats, adding to the car’s “street racer” appearance. The roll bars feature integrated rear headrests. The MINI Cooper S Convertible comes standard with the roll bars trimmed in chrome and a set of centrally located, twin chrome-plated tailpipes integrated into the rear bumper. Speaking of chrome, the optional exterior chrome trim package adds chrome to the mirror caps, rear boot lid hinges and handle along with chrome trim strips in the front and rear bumpers. On the MINI Cooper Convertible the roll bars are trimmed in chrome as part of the package. All MINI Convertibles come standard with PDC Ã¢â‚¬â€œ Park Distance Control for added safety and convenience. The PDC sensors located in the rear bumper measure the distance from the rear of the car to other objects such as a building or another parked car. As the driver backs closer to these objects, the system will sound an alert inside the car that beeps more rapidly as the car gets closer to the object. The tone becomes constant at a threshold prior to the rear bumper making contact with the object. This feature makes the already easy-to-maneuver MINI Convertible even easier to park in tight confines. Like all MINI models, the MINI Convertibles feature frameless power windows. The convertible models are also equipped with a one-button express operation of all four windows. With the touch of a button located at the top of the windshield, all four windows can be raised or lowered simultaneously, making quick work of opening up the car to the elements. To ensure a tight, moisture-free seal, each side-door window lowers slightly when the door is opened, and then rises again when the door is shut. And as expected, all windows are tinted to minimize glare. The MINI Convertibles are available in 10 exterior colors. The Convertible’s side-view mirrors come in body color. With the three colors of the convertible top Ã¢â‚¬â€œ black, blue and green Ã¢â‚¬â€œ there are quite a number of choices for customers to personalize the color combination of their MINI Convertible. The MINI Cooper Convertible comes standard with 15-inch light alloy wheels with a “Five-Star Rocket” design, mounted with standard, 175/65 R15 all-season tires. The MINI Cooper Convertible can be equipped with optional 16″ “Bridge Spoke” or “5-Star Blast” light-alloy wheels mounted with 195/55 R16 run-flat performance tires either as a stand-alone option or as part of the Sport package. The MINI Cooper S Convertible comes standard with 16-inch” V Spoke” Spoke design light-alloy wheels mounted with 195/55 R16 run-flat tires. Optional sport wheels and tires for the MINI Cooper S Convertible include a set of 17-inch “Five-Spoke Bullet” or 17-inch “Web-Spoke” light-alloy wheels with 205/45 R17 run-flat tires. A further option is a 17-inch “Crown-Spoke” wheel mounted with either performance or all-season tires. The interior of the MINI Convertible and the MINI Cooper S Convertible have received the same attention to detail as the exterior. The highest-grade fabrics and surfaces complement the Convertible’s sporting characteristics. The MINI Convertibles offer multiple interior colors including the exclusive water-resistant Sunrise Laser Blue upholstery Ã¢â‚¬â€œ a perfect material for a car which will likely spend most of the time with its top down. There are eight different upholstery choices for the MINI Cooper Convertible and seven different for the MINI Cooper S Convertible. Other upholstery materials include cloth, leather and leatherette. The dashboard and door-panel inserts are available in silver, anthracite and aluminum-style trim. 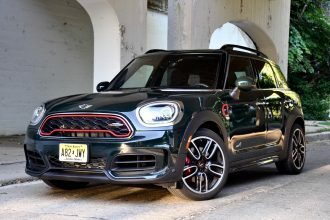 Body colored interior trim Ã¢â‚¬â€œ dashboard and door panels Ã¢â‚¬â€œ is also available to match select exterior colors Ã¢â‚¬â€œ five colors in the Cooper S and four colors in the Cooper. The door panels have a contoured handle, and at night the interior door handles are back lit for ease of locating them in the dark. There is also a courtesy light mounted on the bottom of the doors to illuminate the ground upon entering or exiting the car at night. In addition to housing the overhead courtesy light, map lights and buttons for the fully automatic top, the overhead console also houses pinpoint lights. These amber diodes are illuminated when the headlights are switched on and cascade an unobtrusive ambient light over the center console to aid in easily locating switch gear or items in the console without the need to turn on the interior lights. 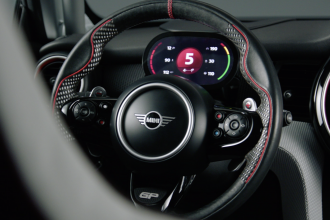 The large speedometer at the center of the dashboard is reminiscent of the Classic Mini and continues on the MINI Convertibles. In addition to a speed read-out, the center gauge cluster incorporates warning lights, coolant and fuel level indicators, and service-interval and tire monitoring system indicators. In true sports car fashion, the tachometer is located directly in front of the driver on the steering column. If the car is equipped with the optional navigational system, the screen is located in the center gauge cluster and the speedometer is relocated adjacent to the tachometer on the steering column. An optional Chrono Gauge Package is available and houses analog readouts for fuel level, coolant temperature, oil pressure and oil temperature. The gauge package is located in the center of the dash and is designed with contrasting sized and colored gauges, reminiscent of a fine chronograph watch. This option gauge package also requires the speedometer to be relocated next to the tach. Adding an elegant touch reminiscent of classic British motorcars is the optional Chrome Line interior trim package which adds chrome around the gauges, air outlets, select dash switches, the parking brake handle and the cup holders. The three-spoke leather-wrapped steering wheel, mounted on a height-adjustable column, adds to the sporting feel inside the Convertible. An optional multi-function sports wheel allows the driver to operate cruise control and radio functions without removing his or her hands from the steering wheel. Front seat occupants get a supportive seat design with manual adjustments for height, fore/aft, rake and head-rest height. Contoured sport seats are available on the MINI Cooper Convertible and come standard on the MINI Cooper S Convertible. Despite its small overall size, the MINI Convertible offers ample seating for four adults. Access to the rear seats is facilitated by wide-opening doors, as well as manual memory function front seats that move far forward. The rear seats are also ergonomically designed and utilize three-point safety belts. Standard child-seat mounting latch points are also conveniently located in the rear seating area for the safe installation of one or two child seats. The extremely stiff body of the MINI Convertibles offers occupants a high level of protection when combined with the standard safety features. These safety features include intelligent front airbags, seatbelt latch tensioners, belt force limiters, head / thorax side airbags, reinforced A-pillars, door beams and strong roll bars. This technology, in combination with a design engineered to manage the absorption of impact energy, offers fully integrated crash protection and occupant safety. The stiff body structure on the Convertible does more than just provide excellent driving and handling characteristics; it is designed to redirect and absorb much of the impact energy away from the passengers and through the body in the event of a collision. 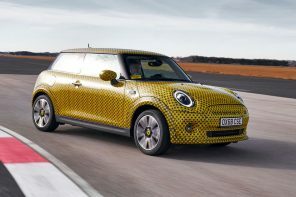 To enhance the already stiff chassis design of the MINI Convertibles, the floor and side sills are specially reinforced. These components are larger and even sturdier in the MINI Convertible, primarily through the use of additional lower B-pillar crossbars and floor pan stiffeners. High strength door beams are also incorporated into the vehicle structure to help reduce intrusion into the passenger compartment during a side impact. High strength aluminum roll-over hoops behind the rear seats along with a reinforced A-pillar- windshield surround helps to protect occupants in the event of a roll-over. Through these additional reinforcements, the Convertible offers a high level of passenger protection while retaining precise and nimble driving dynamics. In high-force frontal crashes, the MINI Convertible powertrain is engineered to “break away” and be pushed under the car as the impact forces are absorbed. This design helps channel energy away from the occupants and reduces the likelihood of intrusion into the passenger compartment. The MINI Convertible comes standard with four airbags. In addition to the two front-mounted airbags, the MINI Convertibles’ two side airbags protect occupants in the event of side impact. These head/thorax airbags are concealed within the Convertible’s seat upholstery. Additionally, the seat belt latch tensioners activate in the event of an impact and tighten the belts to reduce excessive movement of the belted occupants. 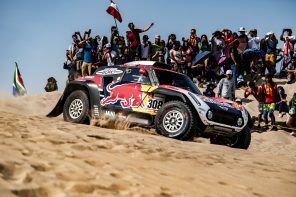 The front belts fasten to the Convertible’s reinforced lower B-pillar; the rear belts attach to the high-strength rear roll bars. The MINI Cooper Convertible and the MINI Cooper S Convertible feature 10.9-inch disc brakes in the front and 10.2-inch disc brakes in the rear, providing optimum stopping power, with standard Anti-Lock Brakes (ABS). Also standard are two other electronic brake control and stability systems offering excellent directional and driving stability, even in extreme situations. 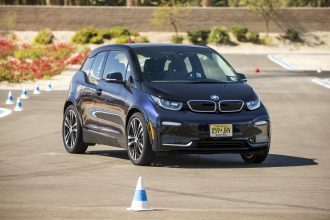 These systems include: Electronic Brake Force Distribution (EBD), which distributes brake forces between front and rear wheels, and, Cornering Brake Control (CBC), which prevents unstable conditions caused by lateral wheel load alterations in cornering situations. Optional control systems include Dynamic Stability Control (DSC), which, when working in concert with the engine management system and braking system, helps keep the vehicle from losing lateral adhesion when pushed to its limits. Working with the ABS system, DSC is able to monitor and intervene in critical situations by applying varied brake forces on individual wheels and changing engine torque through the engine management system. Both the MINI Cooper Convertible and the MINI Cooper S Convertible offer run-flat tire technology. The reinforced sidewalls of the run-flat tires, along with heat-resistant rubber compounds help maintain the tire’s integrity even with a loss of air pressure. This technology helps to keep the deflated tire from completely collapsing or jumping off the rim while keeping frictional heat at a minimum. The MINI Cooper Convertible comes with run-flat tires when the vehicle is equipped with the optional 16-inch wheels. The MINI Cooper S Convertible comes standard with run-flat tires when the car is equipped with either the standard 16-inch wheels or the optional 17-inch wheels. The MINI Convertible can continue for up to 90 miles at speeds up to 50 mph without air pressure in the tires. As an additional tire safety measure, the MINI Cooper Convertible and the MINI Cooper S Convertible both come standard with a tire monitoring system. This system alerts the driver to any potential issue with regard to integrity of one or more tires. When a tire loses pressure, its roll radius and circumference changes, which causes the wheel to rotate at a higher speed. The tire monitoring system uses the ABS sensors to compare the average rotational speed of each wheel in relation to the other wheels. If the average rotational speed of one wheel differs enough to fall out of the rotation average of all wheels Ã¢â‚¬â€œ such as in the event of a loss of pressure – the tire monitoring system will alert the driver. The alert comes in the form of an audible chime and an amber blinking indicator light in the gauge cluster. 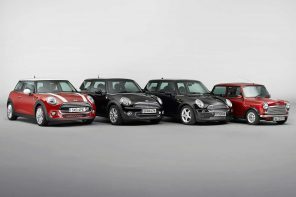 The 1.6 liter four cylinder engines that power the MINI Cooper and MINI Cooper S hardtops are shared with their Convertible counterparts. The engine block in both models is constructed of sturdy cast iron, which reduces engine noise and vibration. The cylinder head is aluminum, and features four hydraulically compensated valves per cylinder driven by an overhead camshaft with roller-type rocker arms. The engine in the MINI Cooper Convertible provides responsive power and motoring fun. 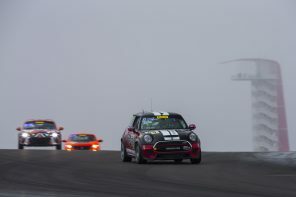 The normally aspirated 1.6-liter unit in the MINI Cooper Convertible generates a maximum output of 115 horsepower at 6,000 rpm and develops maximum torque of 111 pounds-feet at 4,500 rpm. 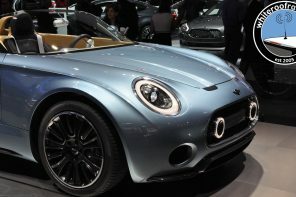 The MINI Cooper S Convertible features a 1.6-liter supercharged power plant. Performance output with its low-restriction exhaust and modified gear ratios is 168 hp at 6,000 rpm. This allows the S Convertible to accelerate from zero to 60 in just 7.0 seconds and achieve a top speed of 138 mph. 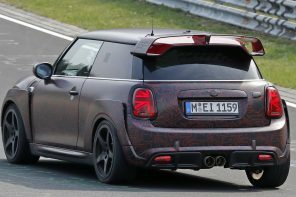 The additional performance of the MINI Cooper S is the result of the 16-valve unit’s mechanically driven supercharger and intercooler. The supercharger compresses the fresh air drawn in by the engine to a pressure of 0.8 bar. 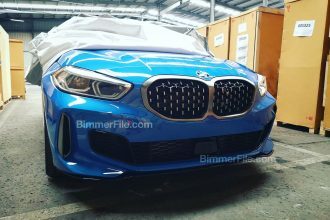 Since the air warms up in this compression process, it is then cooled by an intercooler before entering the combustion chambers, thus ensuring a significant increase in engine charge, output, and performance. Driven by a toothed belt, the compressor builds up torque until peaking at 162 lb-ft at a very useable 4,000 rpm. 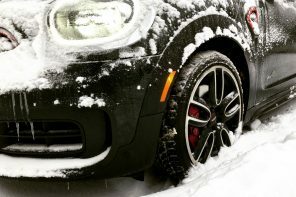 The additional power produced by the MINI Cooper S results in increased thermal and mechanical loads on the power unit, requiring modification from the standard power plant to components such as the crankshaft, pistons, valves, radiator and engine management. The MINI Cooper S Convertible has a Getrag six-speed manual transmission with performance-enhancing modifications to it gearing. By reducing the ratio of the first, second and third to fifth gears, a sprint from 50 mph to 75 mph in fourth gear takes just 6.1 seconds. The same exercise in fifth gear takes just 7.7 seconds. Fuel consumption for the MINI Cooper Convertible is 23/32 miles-per-gallon city/highway for a combined fuel economy rating of 27 mpg. The MINI Cooper S Convertible has a ranking of 21/29 mpg city/highway for a combined rating of 25 mpg. The MINI Convertibles exceed government emissions standards and are clean enough to not require a complex exhaust gas recirculation system. 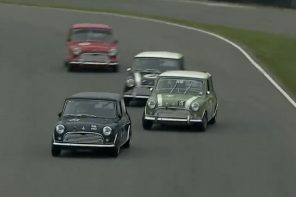 All MINIs utilize drive-by-wire technology, which converts gas pedal actuation into an electrical signal. This signal, in turn, is transferred to a drivetrain control unit, which ensures maximum performance and minimum emissions under all operating conditions. The system also optimizes torque, which makes the engine extremely responsive to driver inputs. The unit also features Adaptive Transmission Control which allows the transmission to adapt to one’s driving style. For example, the transmission will build the revs longer between gear changes if it Ã¢â‚¬Ëœknows’ the driver enjoys taking the car to its limits. The MINI Cooper Convertible continues to be offered with an easy-to-operate continuously variable transmission (CVT), which also contains Steptronic control. Steptronic allows the driver to choose between normal automatic mode, which makes driving in city traffic easier, and a sporty driving mode with a six-stepped “semi-automatic” transmission. While being responsive to drive, the continuously variable transmission is compact and lighter than a conventional automatic transmission. A CVT is different than a conventional automatic transmission. Where conventional systems need a torque converter, the CVT uses an electronically-controlled, oil bath multi-disc coupling. The transmission uses a fixed-length steel drive belt to connect two double cone-shaped belt pulleys which transmit the drive output from the engine, essentially offering infinitely variable transmission ratios. 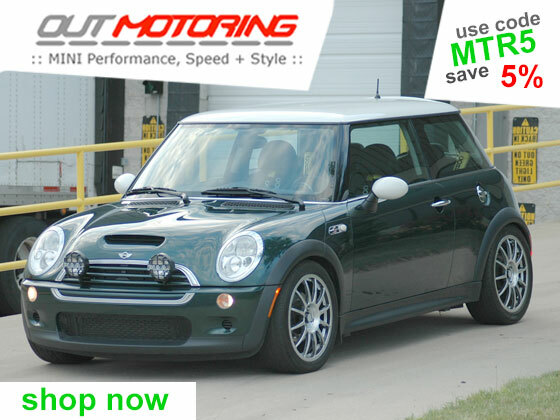 Limited Slip = Performance Grip The MINI Cooper S Convertible can be optioned with a limited slip differential, a performance feature coveted by motoring enthusiasts. The limited slip differential helps to divert more torque towards the drive wheel with better traction, ensuring power is transmitted to the road more effectively. This helps to increase traction under acceleration or during cornering, resulting in improved handling and increased stability. The unit, manufactured by GKN Driveline, is a torque-sensitive differential that manages torque output under acceleration and offers a 30 percent slip rate. This means, there is no loss of torque if the difference in grip between the two wheels is 30 percent or less. 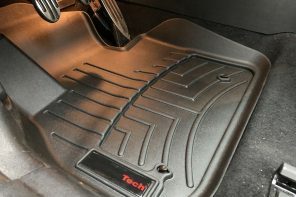 The system also allows the threshold for Dynamic Stability Control (DSC) to be increased without impeding the system’s safe intervention in slippery situations. The limited slip differential is available with the manual 6-speed transmission. Service Interval Indicator The time between service intervals depends on each individual’s driving style. In some cases drivers can travel up to 15,000 miles before the next service is required. The system gathers data on the vehicle’s operating conditions, including things such as fuel consumption and average speed. When the system reaches its threshold, a light on the dashboard informs the driver when a service is necessary. 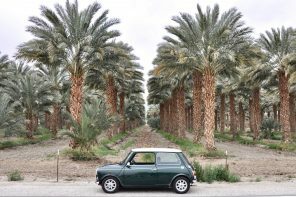 Warranty Coverage All MINIs come with a four-year/50,000 mile new-vehicle warranty, with a 12- year/unlimited- mileage corrosion rust-through warranty. 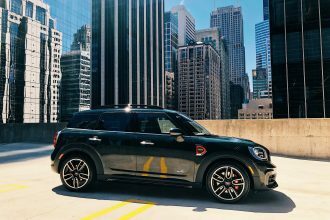 Also part of the warranty package is MINI’s free three-year/36,000-mile, full- maintenance program which includes MINI’s Roadside Assistance Program. The precise handling characteristics of MINI Convertibles are a result of having a low center of gravity, a wide track, a stiff body, a multi-arm rear axle with anti-roll bars and direct, quick-ratio steering. The MINI is a direct descendant of the classic Mini’s design philosophy, which was the first production vehicle to be engineered with a space-saving transverse-mounted power unit driving the front wheels. This design results in a low center of gravity and favorable 60-percent front/40-percent rear weight distribution. 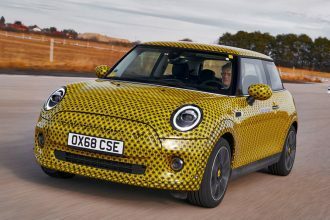 As expected, the MINI Convertibles exhibit responsive handing due to the chassis design, which places the four wheels as far out to the corners as possible. Up front, the MINI Convertible features MacPherson-style struts and a firm anti-roll bar. 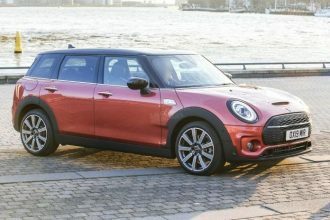 Through the use of an additional axle bearing which allows both axles to be identical in length, the MINI does not exhibit “torque steer” when driven aggressively. The MINI Convertible features a sophisticated multi-arm rear axle which keeps the wheels in full contact with the road at all times. And the rear anti-roll bar helps provide excellent road holding even under hard cornering and on uneven road surfaces, adding to the neutral driving characteristics of the car. 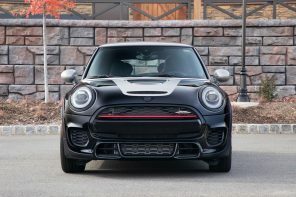 Both the MINI Cooper and the MINI Cooper S Convertibles feature electro-hydraulic power-assist rack-and-pinion steering (EHPAS), which features quick ratio Ã¢â‚¬â€œ 2.5 turns lock-to-lock Ã¢â‚¬â€œ steering and thus an immediate response to steering input. The EHPAS is operated by a small electric motor which differs from traditional hydraulic-pump systems in that it only produces power-assist when the steering wheel is turned, This reduces the need for the engine to constantly drive the hydraulic pump via a belt, thereby adding to performance and reducing fuel consumption. 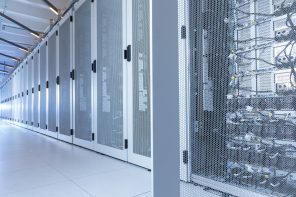 The k-bus system employs mutual data transmission where the same cables are used by multiple systems, thus reducing the amount of wiring required. Besides enhanced reliability, the k-bus system makes assembly much easier, reduces weight and allows for the simpler integration of additional functions such as rain sensors. 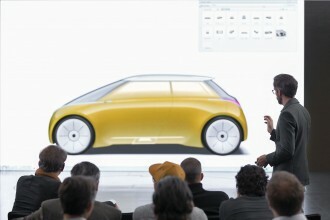 Other high-tech systems not usually found in cars of this class include an optional navigation system with a color display, PDC and the multi-function steering wheel. 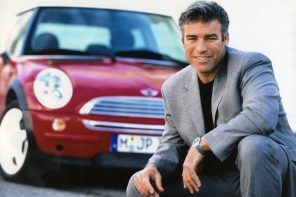 The MINI Convertibles come with Coded Driveaway Protection minimizes theft of the car without the key. Unless the computer chip in the key recognizes a random, rolling code in the car’s memory system, the car will not start. 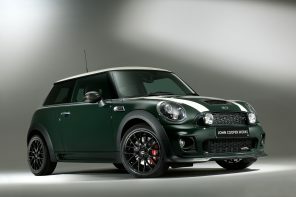 This system, when combined with the optional alarm system, will help reduce the chance of theft of a MINI Convertible. The alarm system, with its own power supply, is triggered upon forced entry through the doors or windows, or by attempting to lift or push the car. The system works even if the roof is in its lowered position. An unauthorized attempt to enter the car causes the hazard warning lights to come on and the horn to sound for 30 seconds. The Convertible’s sound system has been designed to deliver sound performance suited for the car’s interior size and shape. The basic system features six speakers Ã¢â‚¬â€œ four in the front doors and two in the rear side panels. MINI also offers a multitude of audio upgrades, some as dealer installed accessories, including Sirius Satellite and HD radio. An available MINI iPod adaptor is also available as a dealer installed accessory to seamlessly integrate the functionality of Apple’s iPod into MINI’s audio system controls. A six-disc CD changer located in the boot is also available as a dealer installation. And Bluetooth technology is available through a hands-free mobile phone package allowing the driver to operate a compatible phone through the vehicle’s sound system.